(a) Install a clean hose to the ventilation valve. (b) Check ventilation valve operation. Blow air into the cylinder head side, and check that air passes through easily. Blow air into the intake manifold side, and check that air passes through with difficulty. If the result is not as specified, replace the ventilation valve. (c) Remove the hose from the ventilation valve. (a) Visually check if the cap and/or gasket are deformed or damaged. If necessary, repair or replace the cap and/or gasket. (a) Visually check the charcoal canister for cracks or damage. (b) Check the charcoal canister operation. While holding the purge port closed, blow air (0.39 kPa, 4.0 gf/cm2, 0.06 psi) into the vent port, and check that air flows from the air inlet port. If the result is not as specified, replace the charcoal canister assy. While holding the air inlet port closed, blow air (0.39 kPa, 4.0 gf/cm2, 0.06 psi) into the vent port, and check that air flows from the purge port. While holding the air inlet port closed, apply vacuum (3.43 kPa, 25.7 gf/cm2, 1.01 psi) to the vent port, and check that air is sucked in from the purge port. While holding the vent and air inlet ports closed, apply vacuum (3.43 kPa, 25.7 gf/cm2, 1.01 psi) to the purge port, and check that the vacuum is maintained for 1 minute. While holding the vent, purge and air inlet ports closed, apply vacuum (1.42 kPa, 11 mmHg, 0.42 in.Hg) into port A, and measure how long it takes for vacuum to drop. Reinstall the air hose between ports A and B. (e) Measure the VSV resistance for CCV between the terminals. (f) Check VSV operation for CCV. Check that air flows from port A to ports B and C.
(a) Measure the VSV resistance. Check that air does not flow from the port as shown in the illustration. Check that air flows from the port as shown in the illustration. (a) Measure the resistance between terminals 1 (HT) and 2 (+B) and 1 (HT) and 4 (AF-). 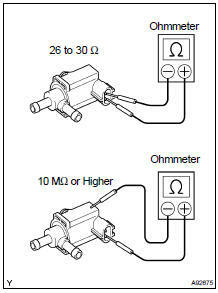 If the result is not as specified, replace the sensor. (a) Measure the resistance between terminals 1 (HT) and 2 (+B).